The next time you’re out running errands around town, take a moment to look at the doors of other homes. They almost all feature kick plates at the bottom in varying colors and styles. Far from being just a decorative add-on, kick plates are actually a practical way to protect the door and extend its life and attractiveness. Here’s some information on the benefits of kick plates on your storm doors and exterior doors. A kick plate’s purpose is just as the name implies: it protects the door where you or somebody else might kick or push it with your feet. We’re always carrying things in and out of our homes – kids, groceries, suitcases, furniture – and when our arms are full, we tend to use our other limbs to help us open and close the doors. Even if you always try to watch how you treat your house, who’s to say a friend, neighbor or service provider would take the same care? A kick plate is a solid, sturdy piece of material affixed to the bottom of your door, tough and resistant to scrapes, dents and scuffs. Do You Need a Storm Door? Maybe you love your front door – it’s an attractive fiberglass or steel door that makes you smile when you enter your home, and you’re not sure about covering it up with an extra glass or screen door. However, there are a few good reasons why a storm door is a great addition to your home. First, it protects that gorgeous door from being damaged by rain, ice and dirt. It also reduces air leakage, which adds an energy-efficient factor to your home. Finally, a storm door is another level of security which may deter an intruder from spending the extra time and effort trying to get into your home. In any case, whether you have a storm door or just a single exterior door, you can install a kick plate to protect it from wear and tear. Do You Need a Kick Plate on Your Storm Door? Since a storm door is the outermost face of your home, it’s only natural that you’d want to protect it and keep it looking sharp. Storm doors are often made from materials such as aluminum, which can be dented or scratched if kicked or bumped. You can extend the life of your storm door with a kick plate, and stop worrying that your next dinner party or service call is going to result in a scuffed-up door that requires a costly and time-consuming replacement. Kick Plates: Inside or Outside? Which side of the door should have a kick plate installed? The answer is simple: the outside, or both sides. The outside is typically where you want to have the attractive and coordinated look of the kick plate, but if you think about it, the inside of your door also has the potential to be scuffed or scraped by shoes and rough treatment. You can install kick plates on both sides of the door if you wish, and enjoy the custom look and protection whether inside or outside. What Do Kick Plates Look Like? A typical kick plate comes in a rectangular shape of about 10 inches tall, and a little narrower in width than the door. They come in enough colors and materials to fit any taste and match any type of home. Look at any home or downtown office – they often have shiny brass kick plates on the doors. Look at an upscale neighborhood with many updated or custom-built homes – you will see more black steel, copper, or colorless kick plates protecting the residents’ storm doors or exterior doors. Kick plates don’t have to be a boring piece of metal stuck on to your door. They come in a wide range of styles and colors. You can find kick plates made of steel, brass, bronze, copper, and other materials. They even come in plastic, although for home design this look may not be what you’re after. Match your kick plates to your home aesthetic – look at your trim, or your countertops to choose how you want to coordinate. 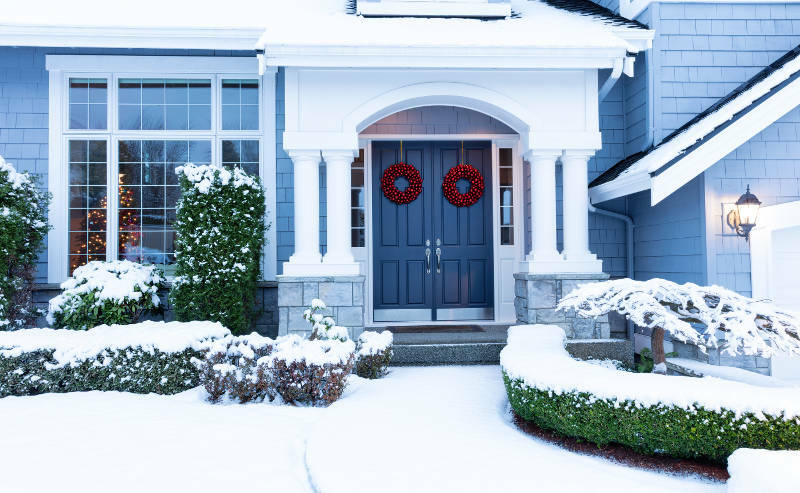 You can put kick plates on your storm doors to not only protect them from wear and tear, but to add a little extra charm and customization to your home. How Much Do Kick Plates Cost? The benefits of kick plates on storm doors far outweigh the effort and expense that it takes to acquire and install them. Who wouldn’t want the beauty and longevity of their expensive exterior doors to be preserved as long as possible? If you want a door with a kick plate, Feldco is here to help. Our storm and entry doors are made to withstand Chicago’s unpredictable weather and look good while doing it. Get a free quote now and see why 350,000 homeowners have trusted us with their home improvement needs.